A “street” fight has begun between proponents of New Urbanism and Landscape Urbanism. New Urbanism is a movement known for promoting walkable, mixed-use neighborhoods and sustainable communities as an alternative to suburban sprawl. Landscape urbanism focuses on landscape as the organizing element for urban space. As someone who is both a new urbanist and a landscape architect, I feel the need to come to the aid of New Urbanism. I developed a partiality for New Urbanism beginning with my experience as a new landscape architect. When I finished college with degrees in landscape architecture and urban geography, I began work in the studio of Ford, Powell & Carson in San Antonio, Texas, and was privileged to be mentored by the great architect, O’Neil Ford. My colleagues and I were expected to be able to design as architects, interior designers, and landscape architects. We participated in all disciplines as we collaborated on complex campus plans and urban design projects. 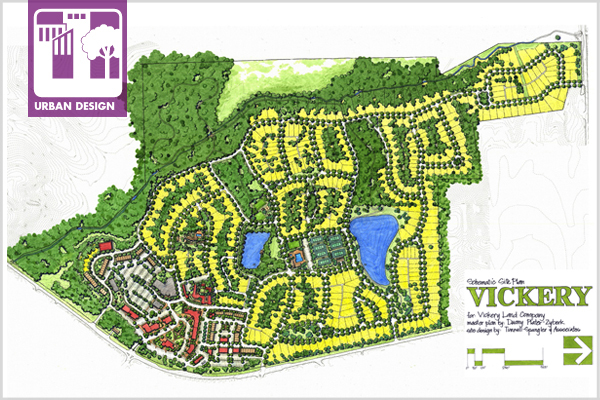 Ten years later, I found myself in Atlanta, Georgia, where the urban planning firm of Duany Plater-Zyberk & Company had just completed a charrette for a new greenfield community called Vickery. Our firm was hired to refine and implement the plan, and as a landscape architect I had respect for the original plan, but I wanted to give it a more “Olmstedian” feel. In this respect, I viewed ecosystems as design components with a plan to seamlessly integrate streets, commercial space, homes, and park space in a suburban context. Vickery’s street system is connected to the existing network, allowing more route options without limiting cars to only one point of entrance and exit. Density is a respectable 5-6 residential units per acre. Vickery has become one of the most successful communities in the Atlanta area and has continued to sell homes during the Great Recession. Leaders of the Landscape Urbanism movement who disagree with New Urbanist principles may not appreciate how it has been successfully applied in places such as Vickery. Here are responses to some of the arguments that have been raised against New Urbanism. New Urbanism’s primary focus is on density. New Urbanism focuses on connectivity, integration with the natural landscape, and awareness of local context. The landscape architecture profession does not truly embrace New Urbanism. This was true in the past. In fact, during the 1990’s, I seemed to be the only landscape architect who was a member of the Congress for New Urbanism. While landscape architects likely worked on New Urbanist projects, they did not lead them. But currently, many members of the profession do embrace its principles in their designs. The work of most major landscape architecture firms has shown New Urbanist principles for two decades. New Urbanist designers tend to favor unconventional and trendy designs. With this view, most designs would become dated the minute they are implemented. In practice, this is not what New Urbanism encourages. Woodstock Downtown and Glenwood Park, two award-winning Atlanta-area projects led by landscape architects, incorporate New Urbanist principles such as connectivity, sidewalk orientation, and a timeless design without being avant-garde. There are no good New Urbanist solutions for existing suburbs. While it is easier to weave natural systems within a lower density context, what about the limitations of existing suburbs? There are great examples of using New Urbanist principles to retrofit suburban sites, such as Glenwood Park and Downtown Woodstock. Landscape Urbanist approaches may work in sites on the urban fringe, such as near waterfronts or in suburban locations, because a design can focus on the biometrics when a site is cleared and redeveloped. However, sites surrounded by existing urban fabric require the more weighted approach of New Urbanism, which more effectively relates to existing streets, blocks, and buildings. I hope that landscape architects will learn more about and apply the principles of New Urbanism. The Congress for the New Urbanism is a great way to learn more about the movement, find resources, and get involved. I also hope that landscape architecture students will learn and understand both New Urbanism and Landscape Urbanism, which are accessible to students at any university (although Harvard is considered the home base of Landscape Urbanism), and appreciate the benefits in both. 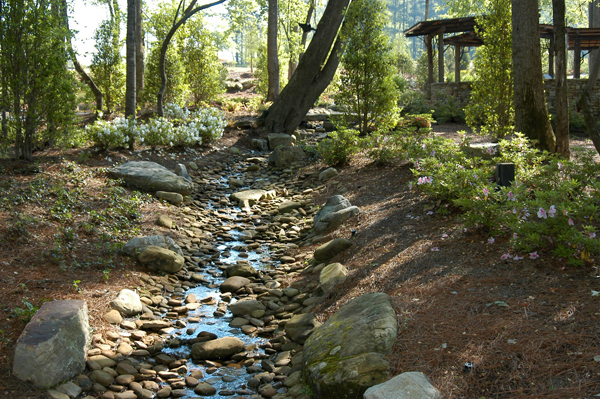 Thomas H. Walsh, ASLA, is the founding principal of Tunnell-Spangler-Walsh & Associates in Atlanta Georgia.